Mini modulator that won't break the bank. Space-saving mini pedals are a huge trend in stompboxes at the moment, and as far as we know the Mod Factory is the smallest pedal that will give you a range of different modulation effects. 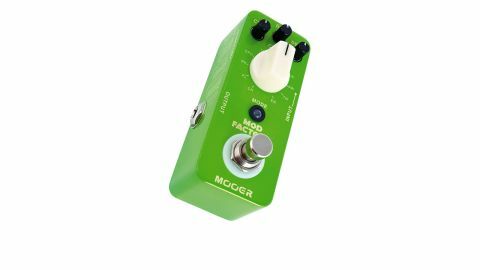 "The Mod Factory is the smallest pedal that will give you a range of different modulation effects"
Three tiny knobs dial in the details: one offers depth and the other two, depending on the effect, control rate or sensitivity, level or tone. There's some very usable stuff here - we particularly like the tremolo - making this pedal a really cost-effective way to add some effects versatility to your 'board. If your budget is as tight as your pedalboard space, the Mod Factory may just be the perfect choice for you.